Amy Mackinnon is a reporter for Foreign Policy magazine, and an award-winning multimedia journalist from Scotland. In recent years, she has reported on eastern Europe. 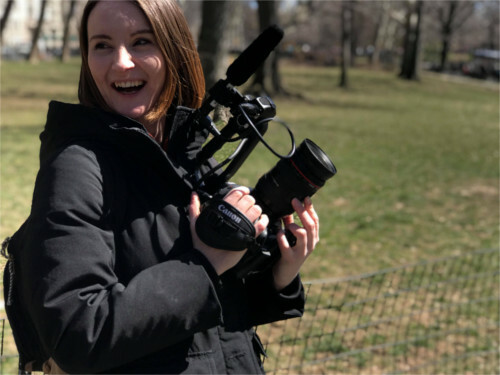 She received a 2018 Alfred I. duPont-Columbia award for her reporting from Russia for the Reveal episode “Russia’s New Scapegoats.” Her work has been published and broadcast by Coda Story, BBC Radio Scotland, Slate, CNN, Foreign Policy, the Sunday Herald, the Sunday Mail and the Daily Record. Mackinnon speaks Russian and holds an MA in Russian and East European Studies from the University of Glasgow. She is currently based in New York while pursuing an MA at the CUNY Graduate School of Journalism with a focus on documentary filmmaking. Education: University of Glasgow, Corvinus University in Budapest, CUNY Graduate School of Journalism. Languages you speak: Native English speaker, decent but flawed Russian, some Czech and French. First job in journalism: Intern at the International Network of Street Newspapers in Glasgow, Scotland. Countries reported from: the U.K., Poland, Hungary, Czech Republic, Russia, Georgia, Belarus, the U.S.A. When and why did you join the OPC? Feel a bit bad for saying this, but for the ID card! The more official-looking documents you have the better when reporting in the former Soviet Union. What sparked your interest in reporting on Russia? A love of great stories, I think. In high school we studied the Russian revolution and the Cold War and I was just riveted, so I decided to study Russian at university. Hard to imagine now but it was a counter-intuitive choice in 2007. Russian studies were in decline, departments were being closed everywhere and Arabic and Chinese were the languages of the day if you were interested in global affairs. Accepting uncertainty, which just seems to be part of the job. I get very anxious in the early stages of a story, as to whether it will pan out. But when it does it makes it all worth it. The nail biting wait for sources and editors to respond to my messages. That and 4 a.m. trips to Tbilisi airport. When traveling, you like to… I walk as much as I can. It’s a great way to get a sense of a new city. Hardest story: Reporting on homophobic vigilantes in St Petersburg Russia for a radio documentary co-produced with Reveal and Coda Story. I’d flip back and forth between meeting with homophobic politicians and vigilantes who would just say the most hateful and unfounded things about LGBT+ people – one guy even broke out into a sweat he became so worked up talking about it. Then later on the same day I’d meet with local activists, members of the LGBT community who of course were the antithesis of all the hateful things I’d heard just hours before. Journalism heroes: Marie Colvin, Khadija Ismayilova, Elena Milashina, Maria Ressa. I love Ellen Barry’s writing. Big admirer of Bellingcat – their ability to fact-check a national government and its propaganda using just open-source data is really incredible. Dream job: As a kid I always loved the idea of becoming a journalist but it seemed very exotic and inaccessible, like aspiring to become a ballerina or an astronaut. Few people end up working in the jobs they dreamt of as kids so I feel insanely fortunate to be where I am now. Most common mistake you’ve seen: Haste. Favorite quote: “To write adverbs is human, to write he said or she said is divine,” from Stephen King’s On Writing. Place you most want to return to: Georgia’s breakaway region of Abkhazia. It’s the most fascinating, beautiful, sad and complicated place I’ve ever been. On the drive into the main city, Sukhumi, you have these dramatic alpine mountains to your right, sapphire blue ocean on the left, and all around you is lush green tropics dotted with abandoned, shot-up houses. I’m not one for keeping a diary but I did on that trip as I was just such as sensory overload.